Renting out an apartment can be rewarding or regretting. To maximize your rental potential you have to make sure you get the right tenants in and have a fair security deposit in place. Charging a low security deposit might attract renters who are more likely to be careless in your property. Here are 10 steps you can follow to ensure the security deposit you require returns your investment. Before you can rent out your apartment you need to know what the laws are where you live. What is the minimum and maximum you are allowed to charge? Is there a difference for pets? Researching this can help you decide on a good figure. Work out a fair security deposit. Having too high of a security deposit may turn too many people away. This could leave you with an unrented apartment that you will still be responsible for making payments on. Think about the potential renter you want in your property. If you are living in the building as well you will need to be aware of the surroundings. Are you against smokers or pets? Inspect the property thoroughly and make sure everything is in proper, working conditions. Consider the fixtures, if any are included, their value should be reflected in the security deposit, just in case of damages. Talk to a real estate agent or other apartment owners or managers in the neighborhood. See what the market value is. Find out what their tenants are paying and what is included in their rentals. In Ontario, security deposits are not allowed. Landlords can collect a rent deposit up to one month’s rent, but this deposit is not a security deposit. According to the Canada Mortgage and Housing Corporation, the last month’s rent can be collected as a deposit, but it can never be used to apply to damages. Landlords collect the last month’s rent, or if rent is paid weekly the last week’s rent, at the beginning of the tenancy and pay the tenant interest. Under the Residential Tenancies Act, the rate of interest to be paid annually to a tenant is equivalent to the rent increase guideline of the same year. This deposit may only be applied to the last month’s rent. It is not considered a damage or security deposit. 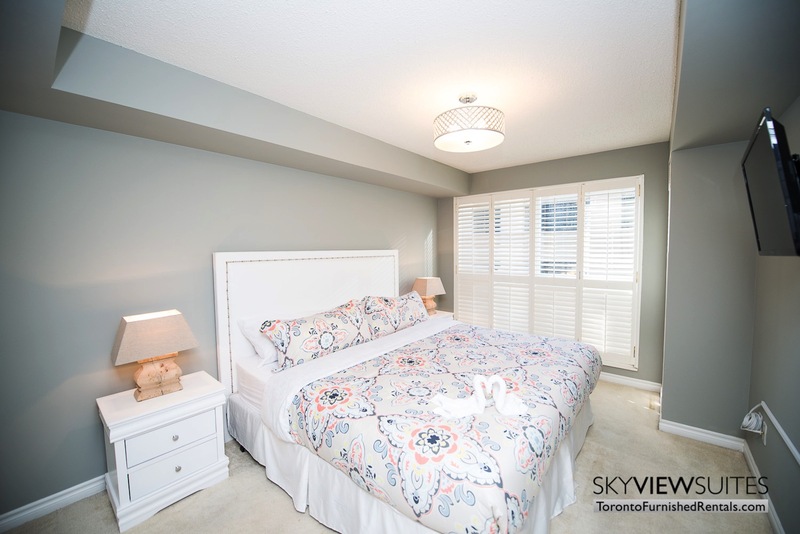 If you’re looking to buy a property in Ontario to rent, and don’t have a place to stay, SkyViewSuites can accommodate you on your stay. Go to www.torontofurnishedrentals.com for more details.